There’s nothing as sweet as a sweet Mutt-i-gree! They all need what we need — they’re really like us! Clearly these lines are not up to Dr. Seuss’s imaginative standards, but chances are the man who wrote “The Cat in the Hat,” and “The Lorax,” would happily applaud the word “Mutt-i-gree,” half whimsy, half serious message, and totally delightful to say. No doubt Dr. Seuss would also appreciate Read Across America, sponsored by the National Education Association. The nation’s largest reading event, Read Across America has promoted reading every March 2 since 1998. And that date is no accident: Theodor Seuss Geisel, a.k.a. Dr. Seuss, was born on March 2, 1904, and Read Across America is designed to celebrate his legacy by getting kids excited about reading. 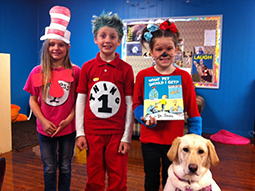 For students in the Mutt-i-grees Curriculum, Read Across America is made to order. Now implemented at more than 4,000 sites, including 658 libraries, the Curriculum has always stressed that the best way to capture the attention of young readers is to hand them a book about pets. In addition, reading to a dog or cat builds a child’s self-esteem and confidence, while shelter pets relax and de-stress to the sound of a calm child’s voice and the gentle attention of being read to. 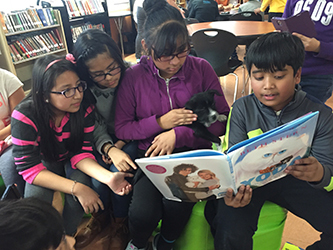 Mutt-i-grees students across the country opened books about dogs, cats, puppies, and kittens to make the most of their deep connection to shelter pets. In Brooklyn, NY, the Mutt-i-grees team joined more than 70 students at M.S. 88 who spent three class periods in the library, reading to dogs from North Shore Animal League America. The event resulted in riveted readers, mellow pets, and one wonderful adoption of an adorable black and white pup by the school’s music teacher! In Conway, AR, preschoolers at Southside Head Start grabbed a favorite book and settled in to read to their adorable Mutt-i-gree plush puppet, which, not surprisingly, was all ears! 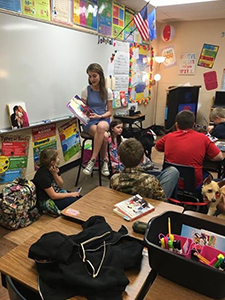 In Bixby, OK, Ragan Fletcher, one of our Mutt-i-grees Curriculum National Student Ambassadors, and her Mutts Club provided more than 200 students at Bixby Central Intermediate School with an afternoon of shelter dogs and storytelling. North Shore Animal League America supplied the book —“Yoda Gets a Buddy,” written by Animal League America Volunteer, Foster Parent, and National Spokesperson Beth Stern. To make the experience even richer, the Humane Society of Tulsa delivered a pack of pups to the school, so children could have fun with Mutt-i-grees while learning about all the animals in need at the Tulsa shelter. 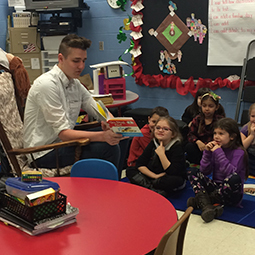 In Ashland, KY, Mutt-i-grees Curriculum National Student Ambassador Layne Meek and members of his Mutt-i-grees Teen Council read aloud to elementary students. They followed up by sending notes home to parents promoting literacy, Mutt-i-gree adoption, and ways to get involved with their local shelter. In Bee Branch, AR, Dixie, the school district’s resident Mutt-i-gree who was rescued by Tim Smith, principal at South Side High School, spent Read Across America day listening to children of all ages regale her with tales of canine and feline empathy and compassion. For Dixie, who regularly assists elementary school counselor Tonya Lovell, it was just another sweet day on the job!